Looking for inspiration on how to style your blazer? Stylist Lauren Goodman helped us put together a slideshow of the top blazer-wearing fashion icons through the decades. From Bianca Jagger to Jane Birkin to Gigi Hadid, you'll find no shortage of old and new ideas for how to rock the tailored jacket with nonchalance and quiet (or not so quiet) glamour. There are peaked lapels to lose your mind over, double-breasted tweeds for cozy winter dates, tuxedo jackets in sleek satin and soft velour--and more in the slideshow below. Marlene Dietrich gives gorgeous tomboy nonchalance in a double-breasted peaked-lapel dream. The German actress and singer shattered the feminine ideal as early as the 1920’s--eschewing gowns and dresses in favor of suiting. Dietrich are her suits, left behind her, a trail of intrigue and broken hearts. 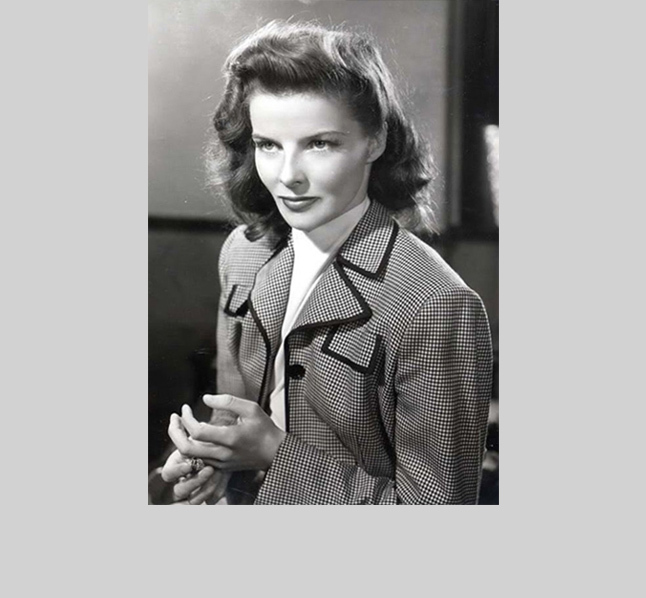 Katherine Hepburn’s fierce beauty is elegantly buttoned up in the 1940’s and 50’s. Here she complements her inimitable cheekbones with an equestrian-style jacket with piped lapels. Francoise Hardy - The 1960’s French songbird looks completely modern--styling a short sleeved boy blazer with a Victorian blouse, denim flares and a slouchy pirate boot to a deliciously bohemian/mod effect. 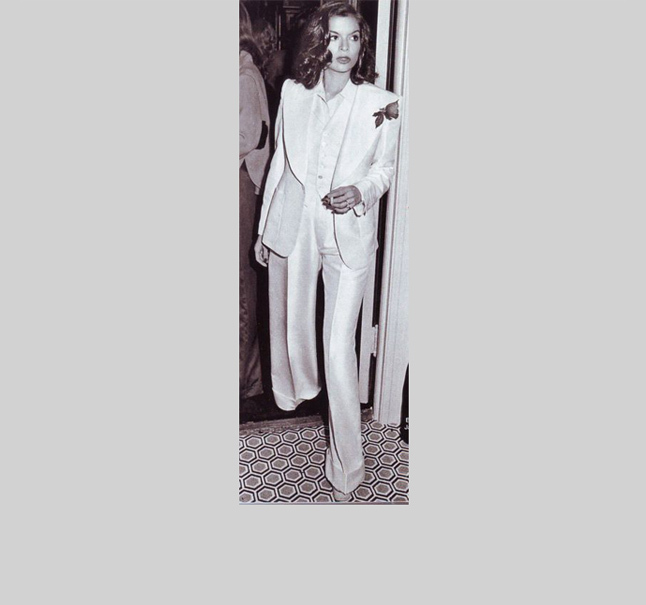 Bianca Jagger loved a suit jacket so much, she famously wed Mick Jagger in one. The the 1970’s, Jagger demonstrated that a woman in a jacket could be the ne plus ultra of elegance, allure, and subversive femininity. YSL’s tall lanky blond muse, Betty Catroux, wore almost exclusively masculine clothes, to louche and glamorous effect. Her influence on fashion cannot be underestimated. After all, “le smoking” (a woman in a tuxedo for evening) was the creation of Saint Laurent himself. Next up is Karl Lagerfeld’s longtime muse, Ines de la Fressange. The waifish French aristocrat, model, author, and empress of French style is ever a tomboy, and rarely found out of a blazer and jeans. Birkin’s daughter Lou Douillon channels her maman, adding a little edge with a mens-y double-breasted plaid jacket over a chambray shirt and high-waisted black jeans. 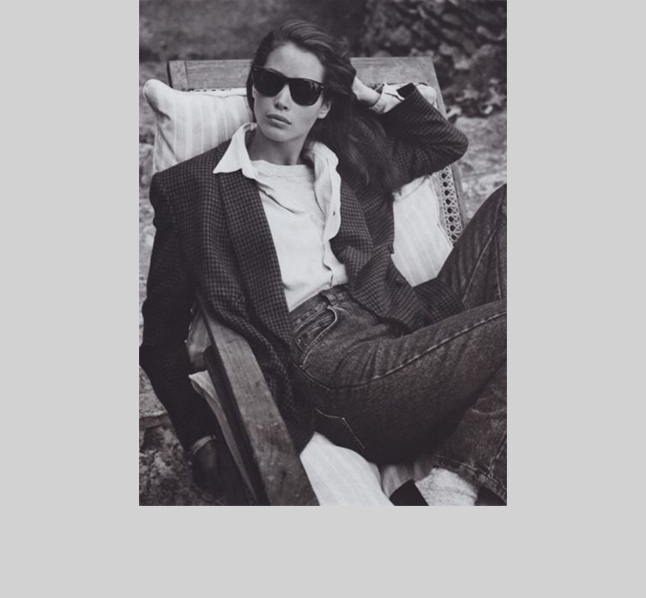 Nineties super model Christy Turlington works the pinnacle of the decade’s I’m-too-cool-to-care vibe: Slouchy boyfriend blazer and shirt, Levi’s, white socks, loafers, Wayfarers and great hair. We want this look right now! Lauren Hutton - The gap-toothed American beauty loves a tailored jacket. Hutton’s no fuss style and carefree spirit reminds us to wear a blazer with a fun-loving attitude. The queen of contrasts, Kate Moss counters the overt romance of this floral flowy gown with a fitted black tuxedo jacket. Lauren Santo Domingo We love how LSD takes the fuss out of formalwear--with a totally appropriate, but not-predictable masculine tuxedo jacket. Style tip: balance that yin, with some yang! Gigi Hadid The model and Instagram sensation finds insta-chic, elevating basics with a pink jacket for date night. The scarf belt is an inspired touch too. Hello--date night! Olsen twin gives major elegance in velvet full length blazer, high rise jean and aviators. What else does one need to add to look super crazy chic. Alexa Chung - Queen of effortless perfection, Alexa reinterprets the 1990’s uniform with high rise flares and a pilgrim shoe. Alexa knows how to keep it basic in the best possible way. Lou Douillon shows panache, pairing a navy shawl collar blazer with a rocker tee, the right pair of jeans, slept-in French-girl hair, and of course a cigarette--not that smoking is cool or anything.